The U.S. dairy industry is under extreme financial pressure. Producers are analyzing every aspect of the farm business during these tough times, and calves are an expensive area of the farm. Calves have high labor requirements and feed costs with little short-term income opportunities. It is important to remember that today's heifer calves are the milking cows in two years. It may be easy to think that you can shave costs in this area without negative impact. However, if calves are short-changed in areas that will result in increased calf loss or illness, reduced farm profitability will extend for much longer. In evaluating where to cut costs in calf raising, first start with the basics that pay big returns. Proper colostrum management is essential to raising healthy calves. 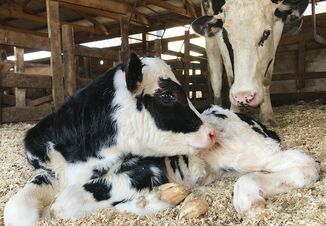 Every calf should be hand-fed 10 percent of its body weight (1 gallon for typical Holstein calf) of high-quality, clean colostrum as soon as possible after birth. recommends a second colostrum feeding within the first 24 hours of life. The second feeding of colostrum can be of lesser quality, however still free of bacterial contamination. Colostrum delivers antibodies from the cow. Calves that receive sufficient antibodies that are absorbed into their bloodstream are said to have "passive (acquired) immunity". By getting calves enough passive immunity through colostrum feeding, sickness will be reduced and gains will be improved. This equates to less labor, feed and drug costs. Equipment needs for calves can be costly. While you may have to delay replacement or purchases, evaluate what you have and make modifications, clean ups or rebuilds until margins improve. Some things are necessary to replace, like worn-out esophageal tube feeders, but maybe milk replacer mixers or hutches that were planned to be replaced can be cleaned up and repaired instead. Evaluate your milk feeding program. If you are on a high milk program, do calves drink all of the milk you offer in the first 10 days? If not, there may be an opportunity to reduce milk waste. While we want to provide all that calves will drink, especially in the first days of life, we also need to be realistic. Are calves weaned on time for your farm goals? Heifers can be weaned as soon as they are consuming adequate starter to maintain their growth, typically two to four pounds per day. Current recommendations are to begin weaning heifers at six weeks of age. According to the most recent National Animal Health Monitoring System (USDA, 2014), average age at weaning for heifers was nine weeks, and 18.9 percent of operations are weaning heifers at 13 or more weeks of age. In many operations, there is likely an opportunity to wean heifers earlier, thus saving costs, without detriment to long-term growth. Reducing starter waste can cut calf raising costs. Calves should be given a small handful of starter to begin with on day three to five of life. Too often, calf raisers will fill the bucket up with starter and wait for the calf to finish the entire bucket before offering more. Calf starter gets stale, heats and molds when left out, reducing intake. Feeding fresh starter daily, only the amount she will clean up, will promote starter intake, resulting in a calf that is ready to be weaned sooner. If it fits into your herd health plan, starter refusals can be fed to older heifers to reduce wastage. Now is a good time to discuss your calf and heifer herd health plan with your veterinarian to ensure that all vaccines, treatment protocols and feed additives are up-to-date. It is important not to cut out items that are beneficial to the animals, but there may be opportunities to cut something that was added in response to a specific problem in the past, or as "extra insurance" when milk price was high. Finally, there can be some income from calves. The majority of dairy producers sell bull calves at a very young age. Evaluate the arrangement you have to sell bulls, and see if there are opportunities to receive a premium. For example, if you currently haul calves to a livestock market, can you sell calves to an individual that would pay a premium and pick up calves themselves? Can you get a premium by showing proof to the buyer that bull calves receive adequate colostrum by blood sampling calves for serum IGG or total proteins? Evaluate if you are selling bulls at the optimal age. If you have housing, labor and excess waste milk, there may be an opportunity to raise some bull calves past weaning to optimize profits. Conversely, if on-farm resources are maxed out, selling extra heifer calves preweaning may optimize labor and housing. Extension personnel, nutritionists and veterinarians to fine-tune calf raising on your farm.